Recent downside pricing pressure on Technology and FANG stocks have kept investors wary of jumping back into the market while we wait to see where the bottom may form. Concerns about long-term pricing pressures, US trade wars and the continued Congressional testimony regarding privacy and censorship issues have kept social media technology stocks in a negative perspective. The only aspect of this pricing pullback that is positive is that these stocks will, at some point, find a price bottom and attempt to rally as investors rush back into their favorites attempting to ride the run higher. Our researchers believe the current price levels could be a prime example of a short-term bottom setting up in certain technology stocks. Both Apple and Amazon are two of the biggest and most actively traded stocks on the US Stock exchange. They differ from many of the other FANG stocks because these companies actually produce and sell consumer products & services that are, in many ways, essential to conducting commerce and trade. 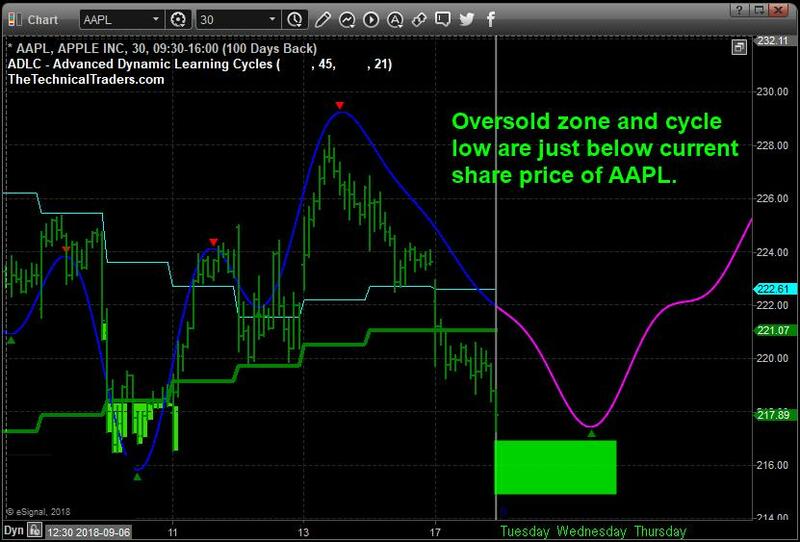 This 30-minute chart of Apple shows our Adaptive Dynamic Learning Cycles price modeling system showing a cycle low is setting up over the next day or two in Apple followed by an upside price cycle that should push prices back above $220. Notice the oversold levels highlighted in BRIGHT GREEN. The last major oversold levels setup just below $218. The current oversold levels are setting up just below $217. We believe these $217 levels will likely set up a price bottom and prompt an upside price rally over the next 5+ days that could push Apple prices well above $225. 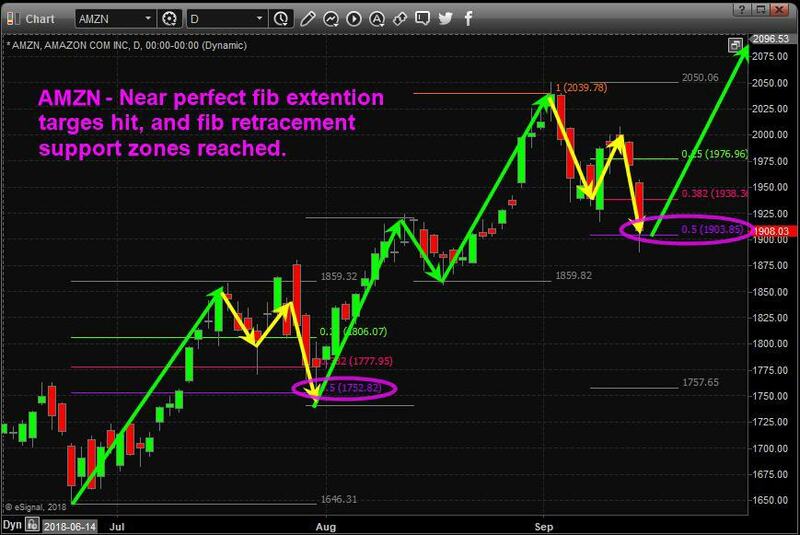 Amazon is setting up a different type of price bottoming formation – a Fibonacci price retracement bottom. We use these Fibonacci price retracement levels in conjunction with our other price modeling systems to attempt to determine where and when price reversals may be set up in the future. In this example, we can see a price bottom formed in early August of a Fibonacci 50% price pullback and the current price pullback is testing the same 50% level. We believe this current setup will prompt a price bottom to form and an upside price rally will likely result in AMZN rushing back above $2000 again with a few days. These types are similar price patterns that show the characteristics of stock price action. Each stock inherently exhibits unique pricing trends and characteristics. Very few are identical in price structure/setup. Although, sometimes certain sectors move in unison. Our predictive price modeling and cycling systems help us to identify the core price function behind the price action. We use these advanced predictive tools to help us understand what is the most likely future outcome of certain stocks and when we see opportunities, we try to alert our followers and members. Our most recent pick was IYT and we’ve been riding that trend for over 5 weeks now. Posted in INO.com ContributorsTagged Amazon.com Inc. (AMZN) Apple Inc. (AAPL) Chris Vermeulen stock analysis technical analysis Technical Traders Ltd.